“The all-seeing eyes of the Buddha represent good luck,” he told me, smiling. “Honestly, I still think they are a little creepy,” I tried to bargain with my horrible bargaining skills. The spontaneous trip to Nepal, I told my families and friends, was a time for quietude and loneliness. I thought in order to grow up I needed both. Every night after I came back from a day of walking, I would sit alone on the hotel bed and think about home. The best part about traveling alone is that I can allow myself for such moments of silent reflection, with no need to entertain anybody, or persuade myself that I am happy enough. Call it weird or anti-social, I honestly do not care. Four years at Notre Dame is ending soon, and I need to start to think about what my future holds and where I should next learn to call home. The memories of Nepal are still there; I can feel them. If I want, I can still hear the piercing honks of motorcycles, the early-rising women of Kathmandu chanting Hindu prayers and the low-pitched prayers of Buddhist monks walking rounds after rounds around the Boudha Stupa. If I want, I can still smell the green curry permeating the air of Thamel, the dew on the trees on the bank of Pokhara’s Phewa Lake, and the incense in every taxi, together with the breath of the taxi driver. No artificial air, no pretended smile, no environmental concern over the black smoke every car emits, Nepal is ranked as one of the happiest places on earth. Dirty and noisy streets, pure and quiet souls. The last morning before I left Nepal, I walked to the Boudha Stupa. It was a group of temples and when I got there the weather was nice and the sun was warm. I took off my shoes when I entered the temples. In one of those temples, I stood in front of a tall statue of the Buddha, with about 30 monks kneeling beside me in two lines. All of them were praying, murmuring scriptures. Feeling embarrassingly displaced at first, I soon found myself sinking into the sounding silence. The entire hall was filled with their deep-voiced prayers. I stood there for a long time, barefoot, almost unable to move. A strange idea emerged — I wanted to spend the rest of my life in that temple, standing among the monks and waiting to turn old. Traveling has showed me so many ways of life. I could live like now, in confusion and constant struggles about the future; I could live like a friend I met at Scotland, working in Burma now and enjoying whatever was making him uncomfortable; I could live like most of my friends, graduating and going into well-known and well-received firms, enjoying the jealous glances of my parents at my graduation ceremony. Nepal showed me that I can also live like that extremely devout Buddhist nun I watched in silence, as she walked around the Stupa and put her forehead to the ground every five steps. There was a smile on her face I dare not forget. Each way of living, I believe, is worth living many times. I hoped to be washed by dusts and purified by walking. I achieved what I came to Nepal for — to realize my own insignificance but at the same time persuade myself that my insignificance is only part of who I am. I am more than that. On the plane back to China, I started to wonder what would happen if I accepted the invitation from the seller of that Buddha Eyes bag and joined him for coffee the next day in downtown Pokhara. I would ask him more about the relationship between Chinese and Nepalese. How’s my country portrayed in their media? What exactly did we do to help them during the earthquake? How many Chinese people had he met and how deep and personal was each meeting? I would also ask him about the Buddha eyes. Had he read a book called “1984”? Didn’t he feel uncomfortable being watched, even if the person watching over him is the Buddha? The all-seeing eyes of the Buddha were not judging, were they? 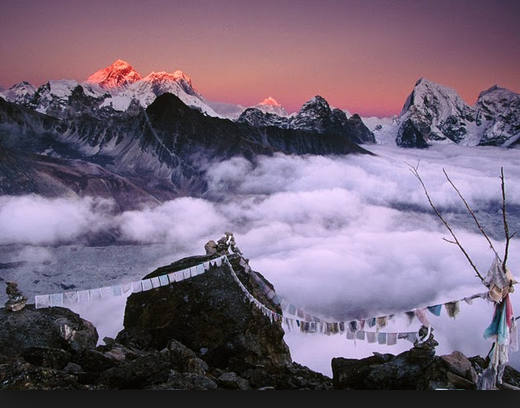 Thinking of these, I felt a burning desire to look outside the window instead of being trapped in my own regrets, and there, I saw the towering Himalaya Mountains and their snow-covered tops glittering in the golden rising sun.